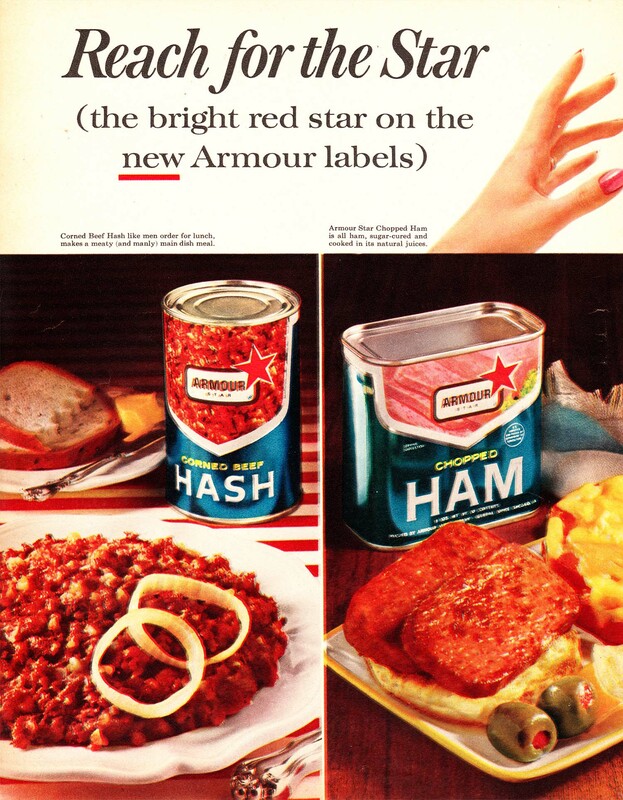 Potted meat has gotten a bad rap over the years. 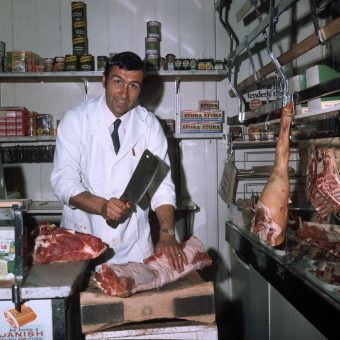 Maybe it’s because of its salty, gelatinous appearance; or, maybe it’s because of its cheapness (as compared to “real” meat). 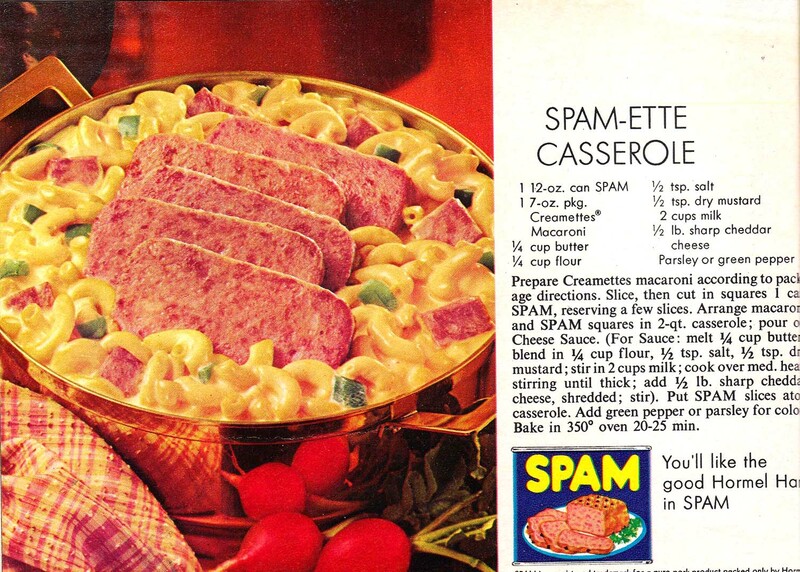 But, when times were hard, SPAM was there for you. 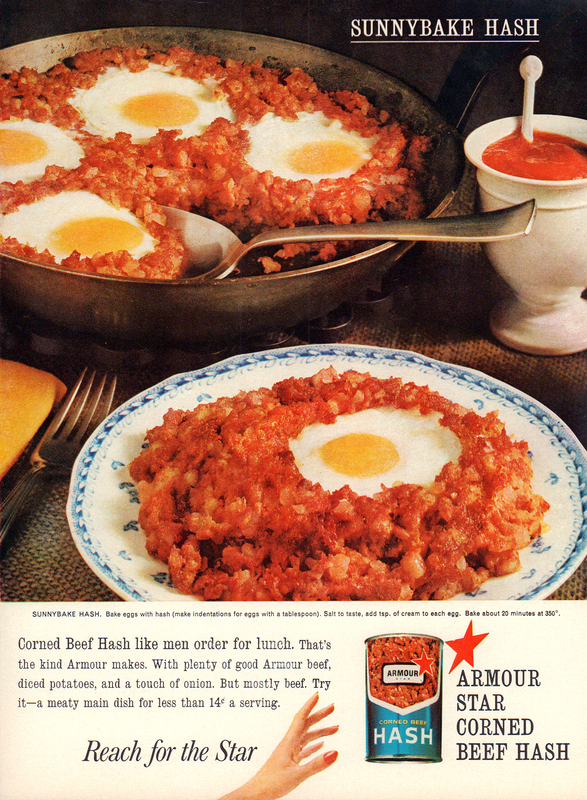 Margaret Thatcher called it a “wartime delicacy”, and Khrushchev said it saved the lives of countless men in the Soviet Army. 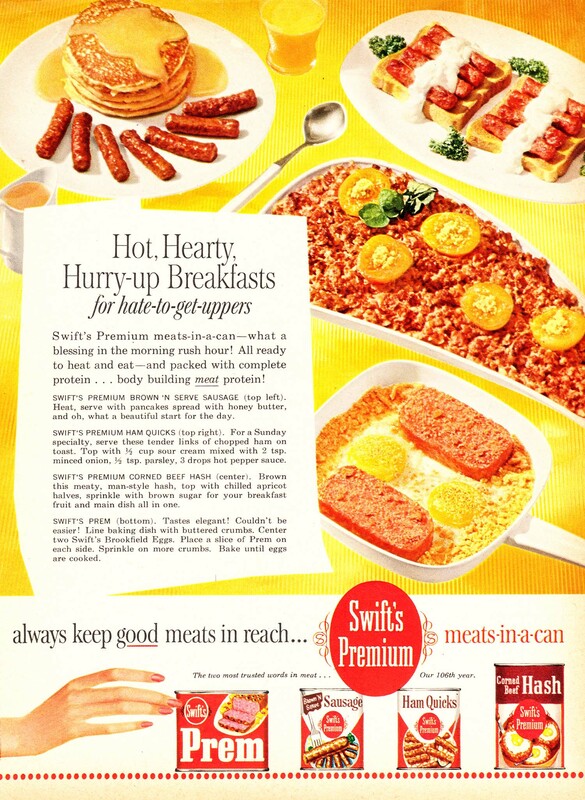 In the post-war years, meat-in-a-can lost its luster. 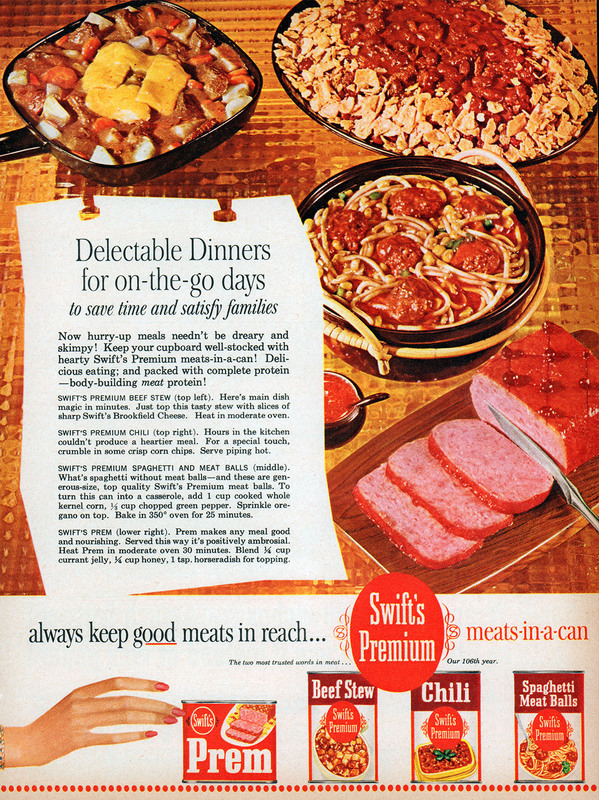 Food wasn’t as scarce, and we could afford better meat… or at least other cheap alternatives such as TV dinner Salisbury Steaks and McDonald’s processed patties. 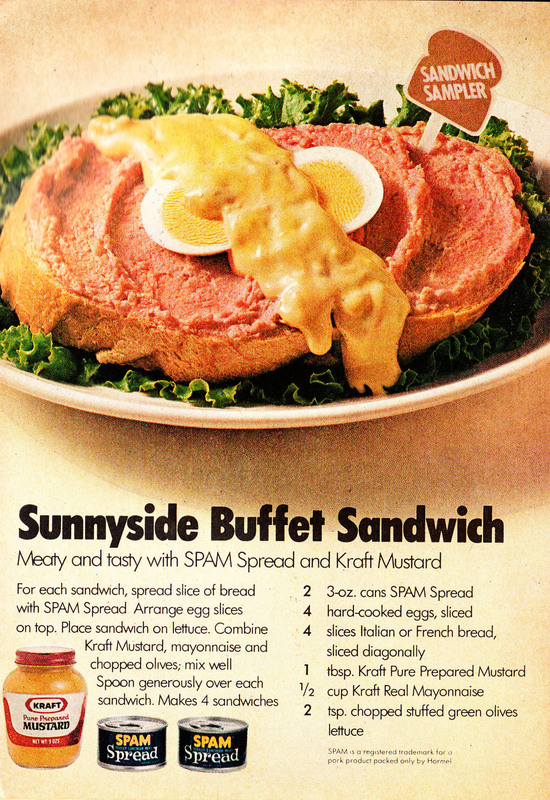 Meat-paste fell out of favor, was called a poverty food, and it became the subject of jokes. 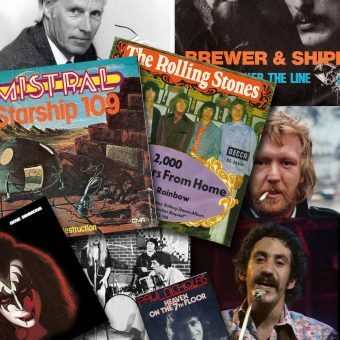 Yet, it still survives – and, in fact, isn’t half bad (in this author’s humble opinion). 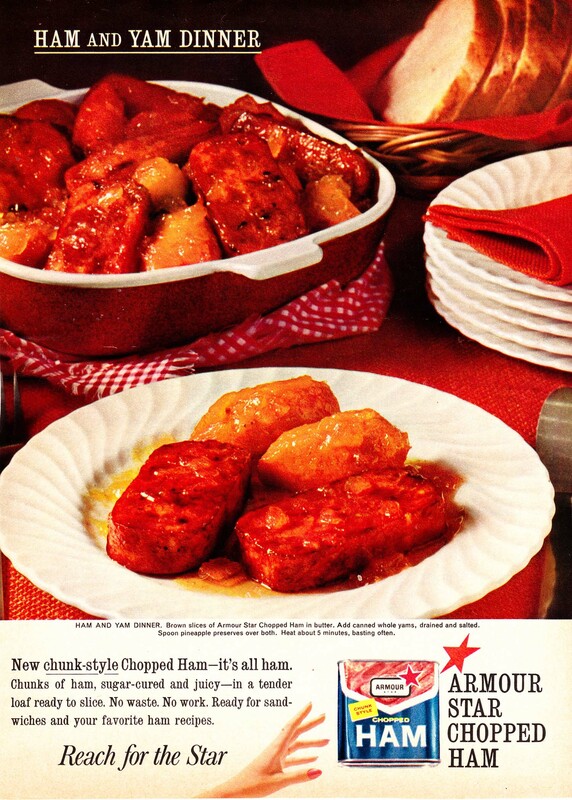 With zillions of pounds of Taco Bell and other fast-food meats ingested every day, we certainly don’t have the high ground to look down upon these humble cans of reconstituted pork. 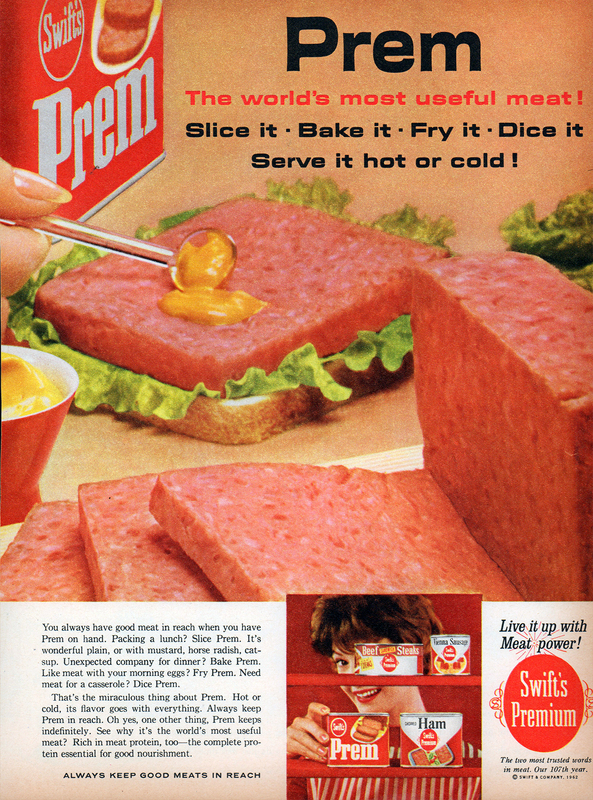 So, let’s have a look at canned meat advertising from years past, specifically the 1960s. Enjoy! 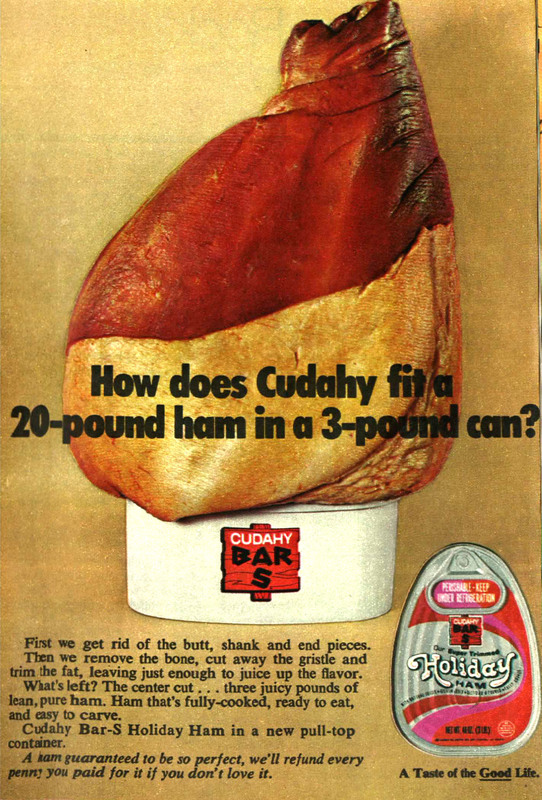 Nothing wrong with a big hunk of canned ham. 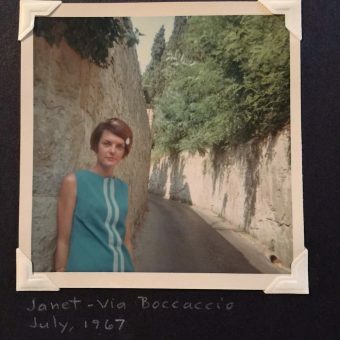 Good work, mom. 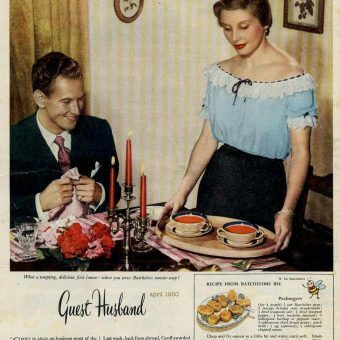 Too bad they replaced you with a houseplant at the head of the table. 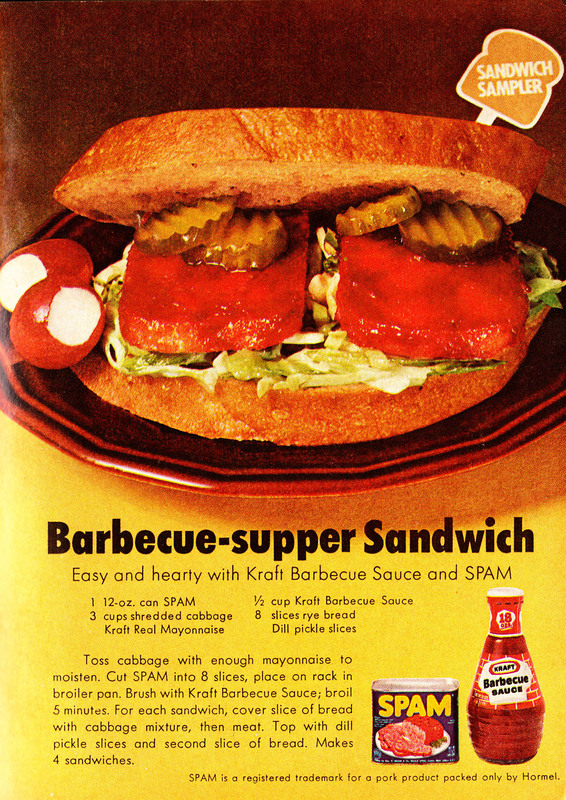 There’s nothing more beautiful than two SPAM patties glistening in the noonday sun. It looks like the cat has thrown up again. Hope she isn’t sick. 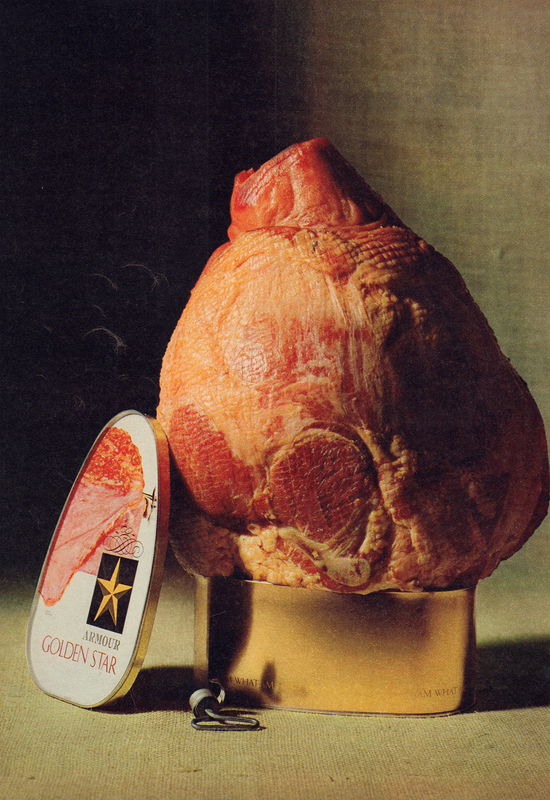 This Armour Golden Star canned ham ad from November 1964 – could they have possibly made it any less appetizing? 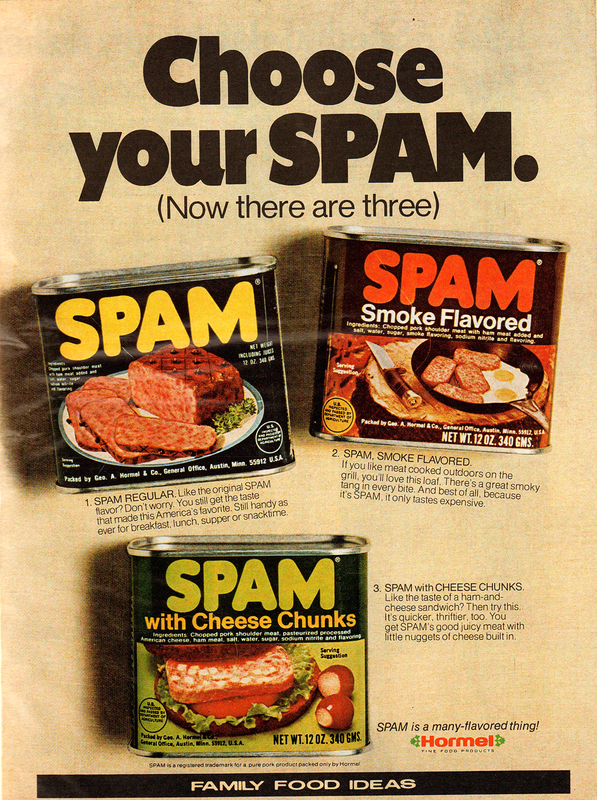 What does SPAM mean? 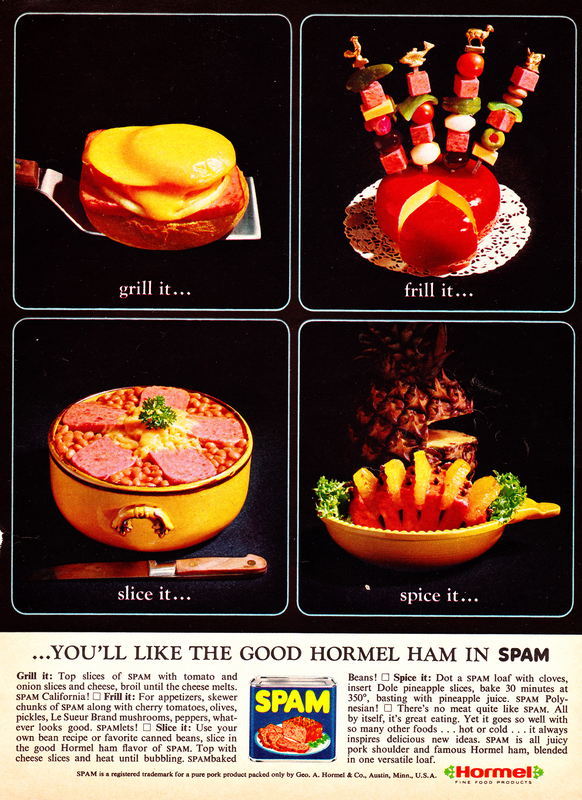 Hormel claims that the meaning of the name “is known by only a small circle of former Hormel Foods executives”. 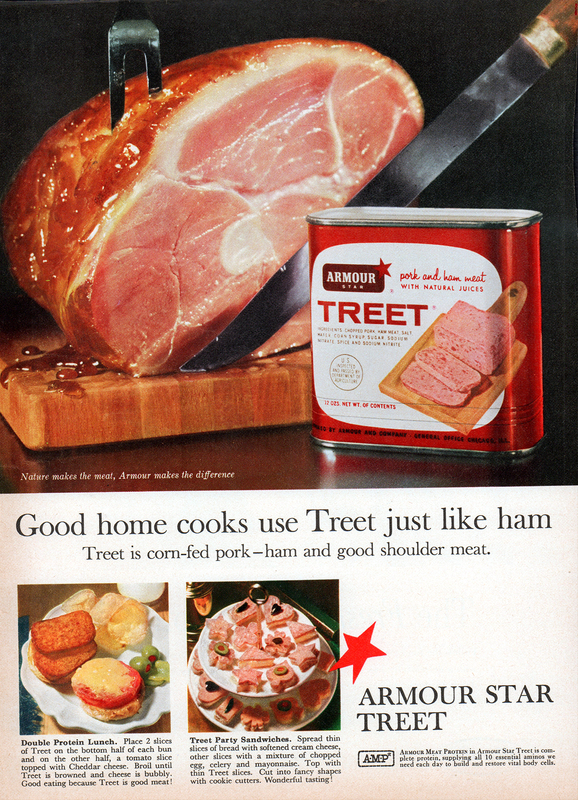 Among the top theories: “spiced ham”, “spare meat”, “shoulders of pork and ham”, “Specially Processed American Meat” or “Specially Processed Army Meat”. 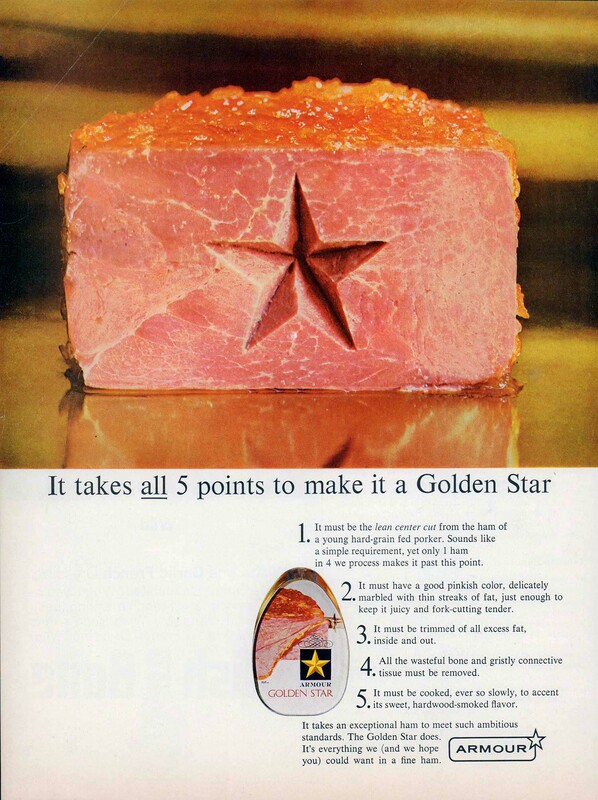 For more SPAM-specific advertising, see this post from 2014. 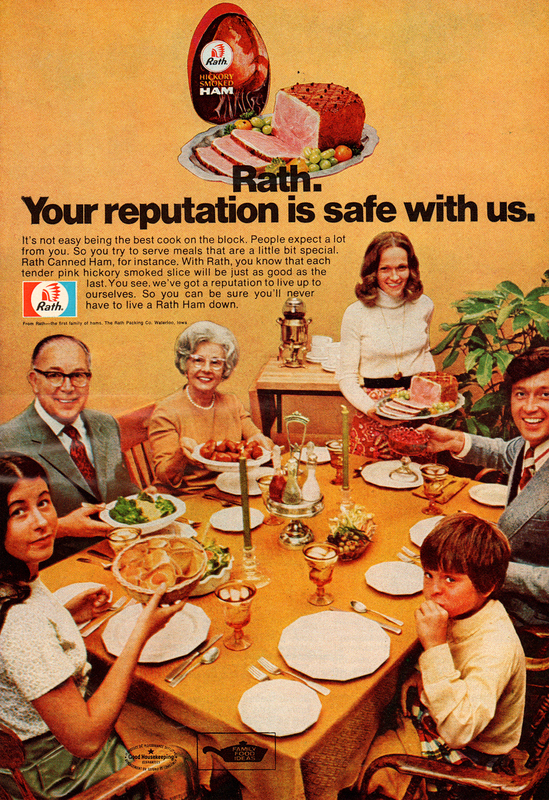 Looks good, but I’d recommend you have a defibrillator close by the dinner table. 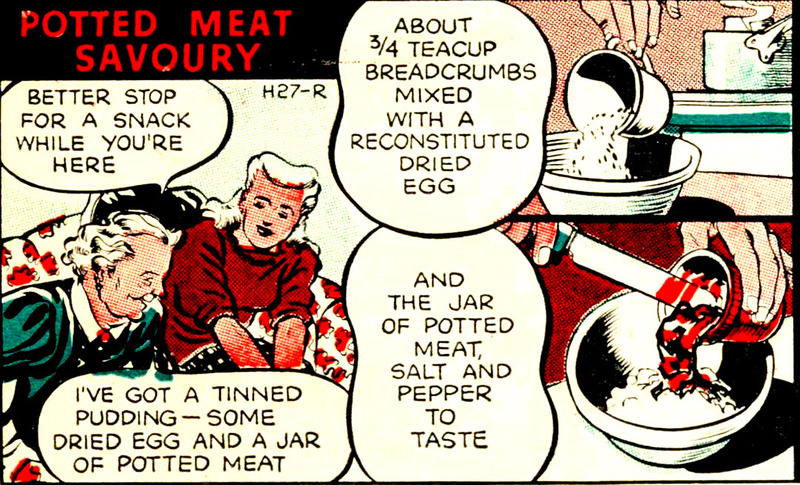 “All the wasteful bone and gristly connective tissue must be removed.” Mmm-mmm. My mouth is watering already!